The name is up on the side of Station 11, expected to open early next month. In big letters high on the wall, its name is hard to miss when you drive past Albany’s new main fire station, now nearing completion. But why do they call it Station 11? Why not Station One, for example, which would seem to make more sense? The designation is the result of the system that’s in place for naming fire stations countywide, and Albany Fire Chief John Bradner explained it to me today. The system’s origins are veiled by the mists of time. But some time long ago, someone decided that for the sake of clarity, each fire department in Linn County would have different number. No doubt this is helpful in dispatching, and maybe for other reasons too. In this system, Albany was assigned the 10s, Sweet Home the 20s, Lebanon the 30s, Harrisburg the 40s, Halsey-Shedd the 50s, Brownsville the 60s, Tangent the 70s, and Scio the 90s. Nobody got the 80s, again for no reason that I could find out. This meant that the first and main station in Albany became 11. 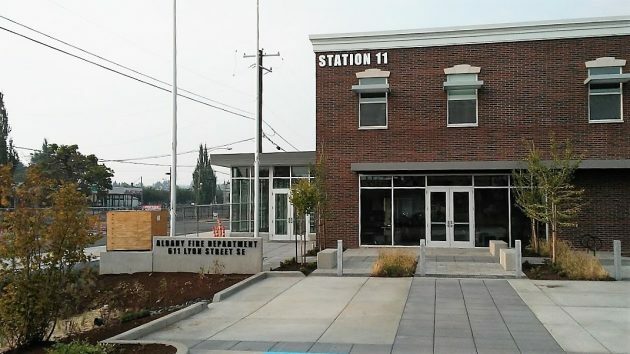 When a second station was built on 34th Avenue in South Albany, it became Station 12. Albany added fire stations east of I-5 and in North Albany in the 1990s, and they became Stations 13 and 14. And if Millersburg builds a fire hall staffed by the Albany department, as seems to be the plan, it will become Station 15. Bradner says the new main station is just about finished. Furniture will be moved in next week, and fire crews housed in temporary quarters off Hill Street during the construction will move into the building with their equipment in the first week of October. The construction project started in August last year with the demolition of the old Station 11. At about the same time construction began on Albany’s new police headquarters on Southwest Pacific Boulevard. That station is expected to be completed in a matter of weeks. 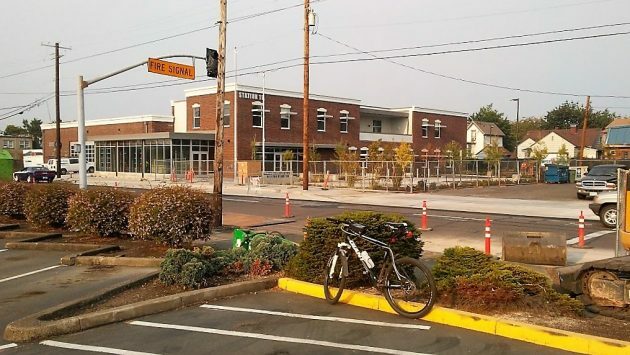 Gerding Builders of Corvallis built both structures under a combined contract of $19.5 million. On Wednesday, the city announced that Station 11 will have its “grand opening” from 4 to 6 p.m. on Oct. 6. The new fire station the way it looked last week from across Lyon Street. This is a fairly common naming scheme, with each fire district within a given dispatch system to be given a separate number. For example Met Com dispatch in Woodburn which dispatches most of Marion County (except Salem and Keizer) has different district numbers for Woodburn, Jefferson, Silverton, Aurora etc. It helps to keep track of the different units going to and from a scene when there is mutual aid among different agencies. The units assigned to a station follow this same numbering scheme: Engine 11, Water Tender 11, Rescue 11 etc. Although I am a little confused why physical engine 131 which is still labeled as RE12 (Reserve Engine 12) is responding as Engine 14 even though the unit labeled as Engine 14 is (or at least was) away fighting the Eagle Creek Fire. Be curious to see if Ladder 11 gets moved back to the downtown station, or if Truck 13 will become Truck 11 now that the new station can support the weight. I also hope that Medic 11 gets fully staffed one of these days. Right now if something were to happen to me, Medic 14 would respond from North Albany instead of a medic of Station 11 which is much closer (although Engine 11 would also probably also respond). The original numbers in Linn County are hundred series Albany being 100, Sweet Home 200, Lebanon 300, etc. In the early 1980’s when we went to a county wide dispatch system renumbering of our stations was needed county wide to improve dispatching of agencies with multiple stations. At the time the two Albany stations were station 1 (6th & Lyon) and Station 2 (34th avenue). The problem was Lebanon and other departments also had stations assigned as station 1’s, 2’s, etc. as well. The decision was made to add the hundred series number to the front of each district’s station to identified the city or district being dispatched and the station number. Albany station 1 and station 2 then became stations 11 and 12 respectfully, with Lebanon becoming stations 31, 32 and so on. With regards to the 80’s, if memory serves me correctly, Scio at the time was assigned 800 but Stayton in Marion County was also assigned as 800, since renumbering was taking place the decision was made at that time to change Scio from 800 to 900 series to limit confusion on emergency incidents that both departments may respond to since they shared a common boundary.